A brand new set by award-winning singer, song-creator, entertainer LJ. Fully produced tracks ranging from the hilarious (Day O, Uncle Louie's Teeth, Terrible Twos) to the touching (On My Dad's Shoulders, Two Peas in a Pod). LJ is a past president of the Connecticut Songwriters Association. He has also worked using music theraputically in hospitals, health centers and at Hospice. LJ is a winner of a Parents Choice Gold Award and an American Library Assn. Notable Recording for Children. Parent's Magazine picked his recording Color Outside The Lines as one of the five Best of 1996 in the nation. In that same article the reviewer Martin Kohn wrote," his song 'Donkey in a Ditch' may be the best chidren's song ever about a basic dilemma: Should we help our fellow creatures even if they do nothing to help us? When it comes to kids' music, Les is more." 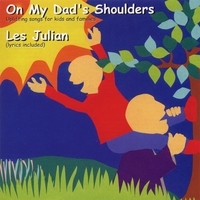 His release, Living In The Land Of Ooh,Aah won a Parents Choice Recommended Award for 1998 and Les is proud to announce his latest CD, On My Dad's Shoulders, a collection of new uplifting songs for kids and families has won a Parents Choice Recommended Award for 2002 and a 2002 National Parenting Publications Honors Award!